The discovery of a beaver-like fossil which lived when the dinosaurs ruled the planet was expected to challenge some of the then-currently accepted ideas on mammal evolution. Castorocauda lutrasimilis, which was unearthed in China, was a species which was previously unknown to science. It dated back to 164 million years ago, a time at which mammals were thought to be primitive creatures confined to the land. But this animal was adapted to life in water, meaning that scientists faced the possibility of a rethink of their theories. The fossil was found in the Middle Jurassic Jiulongshan Formation, a deposit rich in the remains of dinosaurs, early insects, and other organisms. The creature had fur, a broad scaly tail, and webbed feet for swimming. It was about 42cm in length and had seal-like teeth for eating fish. Castorocauda lutrasimilis resembled a modern-day beaver, but belonged to a group that became extinct long before rodents appeared. Such advanced features surprised many scientists at the time of its discovery, suggesting that mammals which lived during the heyday of the dinosaurs had already conquered a variety of environments. 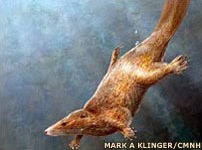 The mammals of the time were once largely thought to be primitive shrew-like creatures, scuttling around the feet of dinosaurs, and only flourishing when the dinosaurs died out some 65 million years ago. Commenting on the find, which was revealed in the Science journal, Thomas Martin of the Forschungsinstitut Senckenberg in Frankfurt, Germany, said it showed that mammals had conquered the water 100 million years earlier than previously thought. This exciting fossil was a further piece in the jigsaw puzzle, one of a series of recent discoveries which served to demonstrate that the diversity and early evolutionary history of mammals was much more complex than was perceived less than a decade ago.